Our country ‘BHARAT’ has distinguish features. It is the home of many traditional arts and crafts. 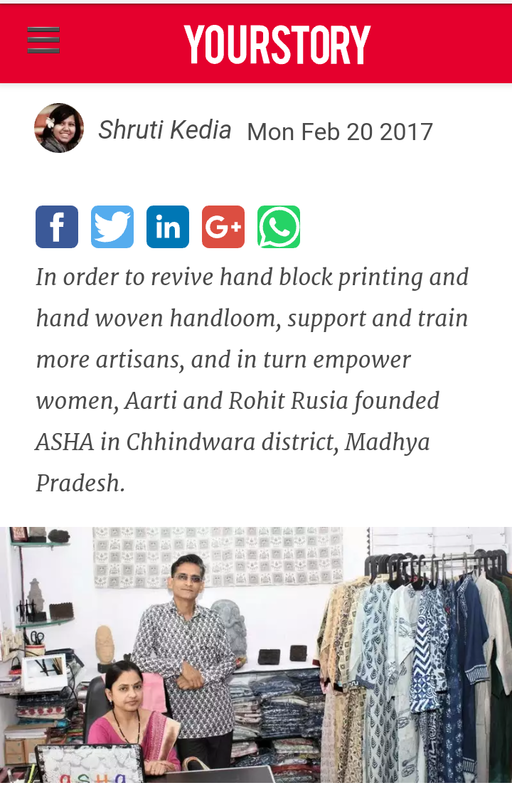 ‘ASHA’ works for the protection & promotion of its nearby artisans and turns their traditional hand block printed work into new and modern text “COTTONFABS” at reasonable prices to reach to more and more consumers. In this traditional art, artisans use wooden mold to engrave designs on cloth. ‘ASHA’ converts this art into other useful apart from fabrics.The aim is that the best quality products should reach to the consumers at affordable prices. Along with the traditional weavers & artisans ‘ASHA’ always try to work with the nearby enthusiastic young designers and unemployed rural women. ‘ASHA’ is constantly trying for the promotion and protection of these unemployed rural women by providing them employment. SHOP OUR WIDEST RANGE OF CLOTHING AND ACCESSORIES & PROMOTE TRADITIONAL ARTISANS & RURAL WOMEN FOR THEIR FIRST STEP IN GLOBAL MARKET.